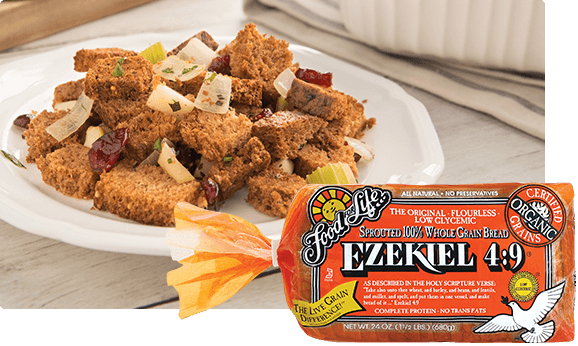 Cut 10 slices of Ezekiel 4:9 Sprouted Whole Grain Bread into crouton-sized pieces. Toast for 10 minutes at 400 degrees Fahrenheit. Pour olive oil, onion, celery and green apple into a heated cast iron skillet. Sautee until soft. Add toasted bread pieces into a large bowl. 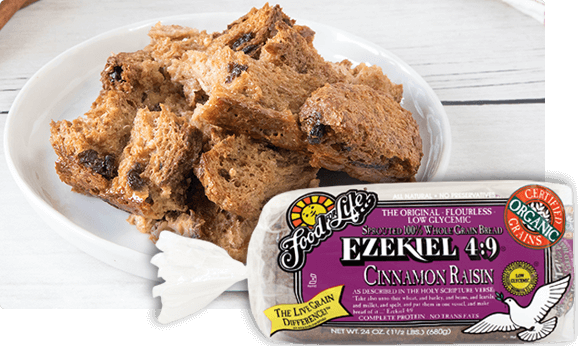 Combine with vegetable and apple mixture. Add dried cranberries, rosemary, thyme and sage. Mix well. Pour two cups of vegetable broth on top. Stir. Transfer all ingredients into casserole dish.